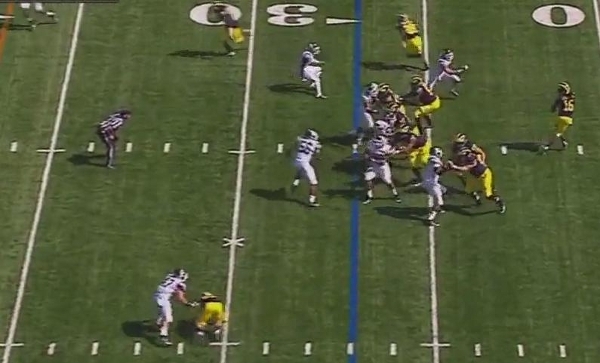 Michigan once again comes out in a three-wide set with a tight end on the line of scrimmage and Toussaint flanking Denard. Here, EMU is in a 4-3 under with one of their safeties pulled into the box. As the ball is snapped, Toussaint immediately starts to his right. Left guard Ricky Barnum steps away from the line of scrimmage and will pull across the formation. 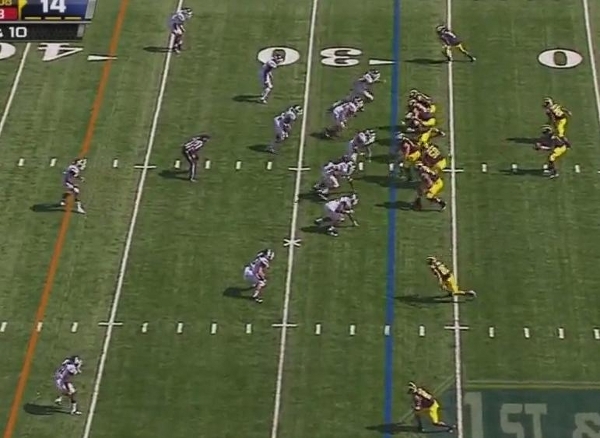 Barnum continues to pull across the formation, but as you can see, the rest of the offensive line is pass blocking. Taylor Lewan has taken a step back from the line of scrimmage despite not being rushed by anyone and the rest of the line is careful not to rush downfield. Importantly, however, the linebackers have identified Barnum pulling across the formation and have reacted by rushing upfield. Touissaint is leaking out of the backfield and running by the linebackers, one of whom now recognizes that Denard is stepping back to pass. Barnum has pulled around the formation but, IMO, missed his block on the closest rusher, who will force Denard to throw the ball a little soon. Notice, though, that Barnum doesn't cross the line of scrimmage, a clear sign that this was a designed passing play. 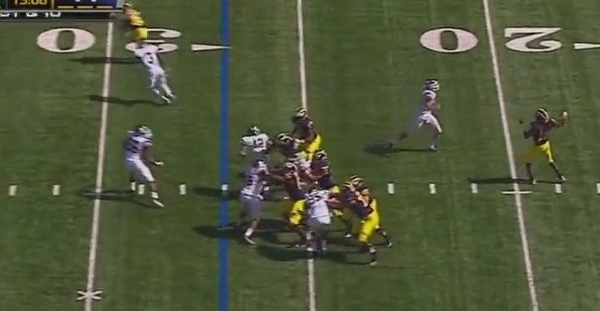 Denard steps back to pass--again, probably too early, but that was forced--and lofts the ball to Toussaint down the sideline who hears the footsteps of the EMU safety and drops the pass. This is an interesting play. First of all, hats off to the EMU linebacker who recognized it and covered Toussaint. Had he not gotten back in time, this is an easier throw and a possible touchdown. 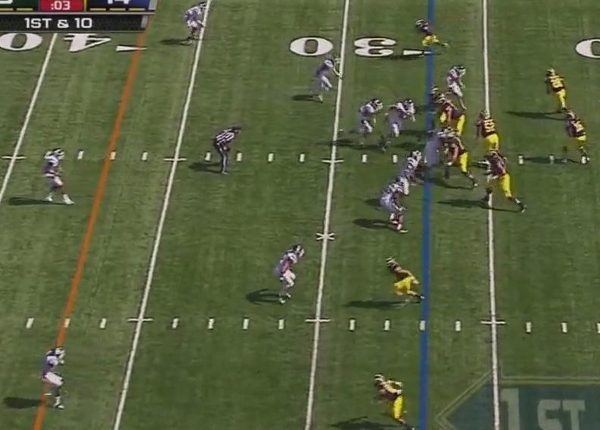 But this play is intriguing because it's basically just a simple play action pass. 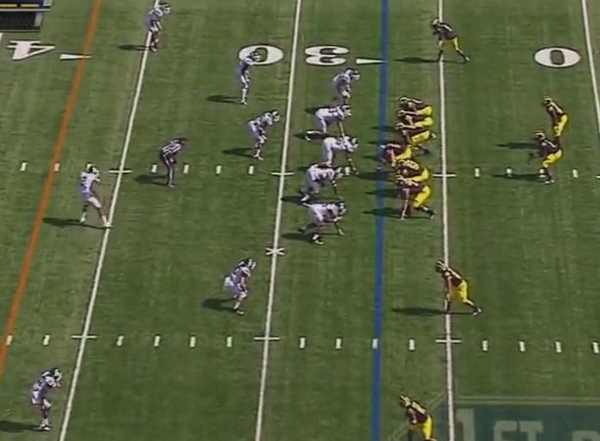 Last year, Denard only needed to take a step or two toward the line of scrimmage to bait opposing defenders, but here, Hoke and Borges bring a power running sensibility to the play: pull the backside guard. By using a defensive key (pulling lineman) to sell the run, Borges can manipulate linebackers and force them to react to something that's not going to happen. The differences between this and Rodriguez's variation go further. Toussaint and Roundtree essentially run a smash concept that forces the safety to make a decision on who to cover, the deep or short route. The hope here, like it was last year, is to get the safeties to neglect their deep coverage responsibilities as the receivers streak downfield. On this play, the safety stays with Roundtree running downfield, which opens the underneath zone where Toussaint is running. If Barnum blocks the man pressuring Denard, he doesn't have to loft this pass to Toussaint, giving the safety less time to defend the play. While Borges might not be able to totally maximize Denard's talents, it's clear that he gets it and is willing to tinker and experiment with offensive playcalling to punish a defense. Great work! I really enjoy reading these analyses. Very good. This is clear, short, and very easily understood. The author not only knows football, but can use written communication well (a rarity among football sites). This is becoming my favorite site for learning more about football intricacies.